The line of a road can be seen traversing the slopes of Knockfarrel, between Meikle Ussie and Fodderty. 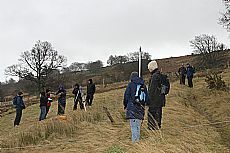 The route can be seen on the ground in places as a double embanked feature zig-zagging across the steep slopes above Fodderty to lessen the gradient for travellers along the route. The church site at Fodderty and the chapel at Inchrory may well have stood on the route at an important crossing point across the Peffery river. In medieval times the firth is believed to have reached as far inland as Fodderty, making a lot of the land boggy and inaccessible. This rough and impassable terrain may account for the route ‘bypassing’ Dingwall and would have increased the importance of this crossing point. Above Fodderty in places the route runs along the 'Coffin Road', used by residents of Mulbuie, who wished to be buried with their kinsfolk from Loch Ussie. Both communities had been cleared from Strathconon to their respective new settlements in the 1800s. 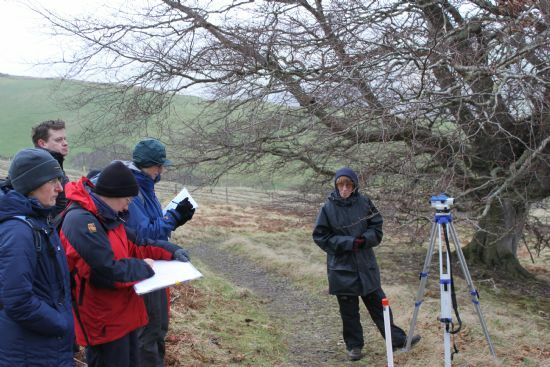 The double embanked feature was surveyed by members of the Pathways into the Past course to record the shape of the double embanked feature. This record will allow comparison with other sections of double embanked feature on the route being explored by Pathways into the Past and the Road Through Ross Project. More information can be found about the Pathways into the Past Project here.